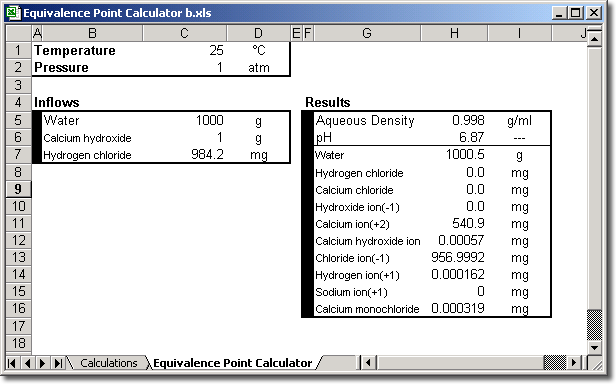 provides access to advanced thermodynamic calculations through the Excel spreadsheet interface. It integrates the OLI aqueous simulation engine and database with the flexible structure of a standard spreadsheet. Applications that are simple or sophisticated can be created to satisfy needs ranging from simple calculators of stream parameters to titration curves or surveys and sophisticated process simulations that are integrated with plant information management systems. The flexibility of the layout is important. Workbooks can be organized in almost any manner desired. Complex series of calculations can be simplified by structuring the workbook layout. Data entry and key result values can be shown on one worksheet while the complete results are available on other worksheets and the details of the calculations on another. Data can even be stored in other workbook files if necessary. Turner Technology will work with clients to customize the interface to their needs, to integrate calcAQ with their current data management mechanisms, or to develop applications unique to their situation. The current version is 9.2. Contact support for update information.